It is the first temple you will come across in your hike to Mount Agung since it is located at the foot of the mountains. There is no entry fee but you will find a number of people offering to guide you through the place. The temple is settled in the midst of forest like setting and offers visuals that are stunning. You might have to walk few steps to reach the temple. The prayers are done by the priests of the temple and you might need their permission to enter and pray. Come with your family to experience the spiritual vibes that this place has. It is one of the best things to visit in Bali. An ideal Bali trip includes top things to do in Bali like Tanah Lot Temple, Tirta Empul, Mount Agung, Mount Batur and Bali Bird Park. For other interesting insights of the city, you can explore Bali tours. Oomph up your visit by adding the best hotels in Bali like Yulia Village Inn Ubud, Bije Sari Suite Bisma, Batu Empug Ubud and Gatra Ubud Inn. 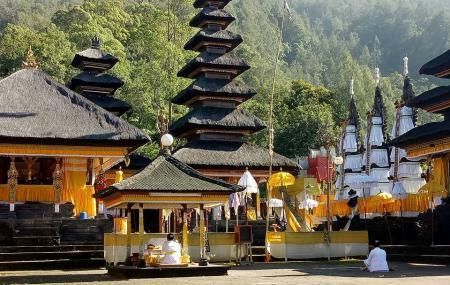 If you want to add the visit to Pura Pasar Agung in your trip, you can choose from the variety of Bali vacation packages that can be designed to suit your preferences. These packages also cover your major concern of how to reach Bali. How popular is Pura Pasar Agung? People normally club together Mount Agung and Pura Besakih while planning their visit to Pura Pasar Agung. About fees, guides and path start: Once you arrive you will be surrounded by guides which will try to scam you for 100 IDR per person to hike the mountain. I recommend the following: 1. Park your bike before parking lot so guides couldn't see what your bike was(they can and will harm your bike if you won't pay); 2. Do not pay and don't speak to them. They will threat you with calling police and will say some important ceremonies are happening(full moon or whatever random occasion). Of course do your homework and get to know if any major ceremonies happening actually so you won't be in trouble. 3. Then go up and before entering final steps to temple go left and forward. There will be a path which will go straight to the top without any unobvious turns. I will attach pictures of where to go. 4. It will take 4 hours to the top, so better come early and take food and water.